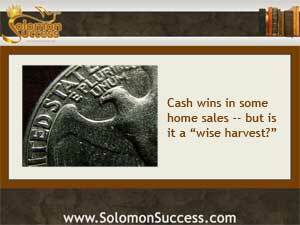 Solomon Success > Blog > Cash for Quick Home Sales: A Wise Harvest? Cash for Quick Home Sales: A Wise Harvest? In King Solomon’s day, credit wasn’t much of an issue. But the wise king’s advice to manage money responsibly and save up resources applies across the ages. “Go to the ant, O sluggard,” he say s in Proverbs 6_ 6-8,” Which, although she hath no guide, nor master, nor captain, provideth her meat for herself in summer, and gathereth her food in the harvest.” In today’s tight housing market, those who, like that ant, have gathered their resources and can pay cash for a property may gain an edge over mortgage holders in the competition or available priorities. Recent data crunched by DataQuick reveal that the number of homes bought with cash has been rising steadily over the last few years, with cash transactions accounting for as much as 30 percent of home sales in some major markets. The reasons? Although hosing prices are rising, in many areas they’re remaining low enough to put a cash purchase within reach of many buyers. When home prices hit higher levels, that excludes most c buyers except those backed by large investment groups. Now, lower-cots homes, especially foreclosures, are available to residential homebuyers as well as startup investors. Foreign buyers also account for a significant percentage of cash sales. Whether buying fur investment purposes or just to have a vacation home, well-off foreign buyers are finding American real estate a secure place to put their money. Cash ales bypass complicated financing issues and make for a quick sale. Sellers love cash sales. The sale moves quickly without glitches related to financing and there’s no worry about defaulting on mortgage payments down the line. Given a choice of a buyer with cash in hand over a qualified buyer with a loan, many sellers opt for the cash, leaving the “typical” homebuyer locked out. Where does the money come from? Some cash buyers are backed by third party financial groups or individuals. But, say real estate pros, still others have raided retirement accounts and investment portfolios, rolled over money from a previous home sale, or tapped into inheritances. Younger buyers may even turn to parents for a cash boost. While cash sales are quick sales, cash buyers miss out on the benefits of using other people’s money and being able to “refi till you die,” as Jason Hartman says. They lose the tax breaks that come with long-term mortgages and lose leverage over the lifetime of the purchase. But Ilyce Glink, managing editor of the Equifax Finance Blog, points out that in many sales, cash is only a bargaining chip. Offering cash gets a buyer’s foot in the door and catches a seller’s attention, according to Glink. Ad once a buyer establishes the ability to back the purchase with cash; they can go out and get a traditional mortgage to actually carry the sale. Glink, Ilyce. “In Housing, Cash is King.” Spaces. Yahoo Homes, 11 June 2013. Tax Lien Sales: A Prudent Avenue for Investing?